Check out this cocktail inspired by Ellen Crosby's The Champagne Conspiracy, and then make sure you're signed in and comment at the bottom for a chance to win a copy of the latest Wine Country Mystery! While prohibition-era speakeasies and classic cocktails are all the rage, I'd prefer to do my drinking legally and in the open comfort of friends and friendly strangers. So speak easy and drink fizzy with this week's Pick Your Poison—where we create a cocktail inspired by a recently published mystery, thriller, or crime novel—“The Champagne Conspir-Fizzy” cocktail, inspired by Ellen Crosby's upcoming Wine Country Mystery, The Champagne Conspiracy! The Champagne Conspiracy by Ellen Crosby is the 7th Wine Country Mystery, featuring a nearly century-old mysterious death and an explosive family secret (Available November 1, 2016). Drop a sugar cube into a champagne flute. Splash 2-3 dashes of bitters onto the sugar cube to soak it. Slowly pour champagne into flute. Cut a slice of lemon peel and squeeze the oils on top of the drink. Rub the rim of the glass with the peel and drop into the drink. Watch the bubbles subside and enjoy! Let the bubbles go straight to your head with “The Champagne Conspir-Fizzy” cocktail, and don't forget to pick up your copy of The Champagne Conspiracy by Ellen Crosby! Comment below for a chance to win a copy of The Champagne Conspiracy by Ellen Crosby! The Champagne Conspiracy Comment Sweepstakes: NO PURCHASE NECESSARY TO ENTER OR WIN. A purchase does not improve your chances of winning. Sweepstakes open to legal residents of 50 United States, D.C., and Canada (excluding Quebec), who are 18 years or older as of the date of entry. To enter, complete the “Post a Comment” entry at https://www.criminalelement.com/blogs/2016/09/the-champagne-conspir-fizzy-cocktail-comment-sweepstakes beginning at 4:30 p.m. Eastern Time (ET) September 2, 2016. Sweepstakes ends 4:29 p.m. ET September 16, 2016. Void outside the United States and Canada and where prohibited by law. Please see full details and official rules here. Sponsor: Macmillan, 175 Fifth Ave., New York, NY 10010. 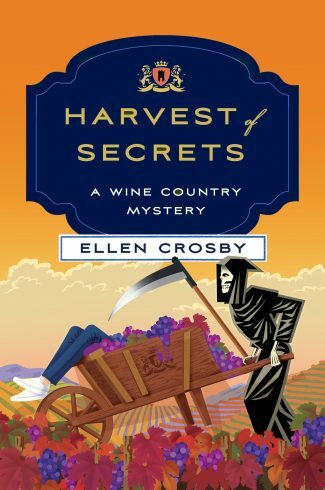 Ellen Crosby is the author six books in the Virginia wine country mystery series, which began with The Merlot Murders. She has also written a mystery series featuring international photojournalist Sophie Medina (Multiple Exposure and Ghost Image). Previously, she worked as a freelance reporter for The Washington Post, Moscow correspondent for ABC News Radio, and as an economist at the U.S. Senate. I’m always ready for anything with champange and the next Ellen Crosby book. Sooooooo looking forward to The Champagne Conspiracy!!!! I can’t wait to read this! Sounds great! I am so glad there is another book in the Virginia vineyard series. Love the characters and have learned a lot about wine….but the champagne drink sounds delicious too! Champagne is my favorite drink! A nice light drink to enjoy. Love to drink and read! Love a good bubbly and love a good book! Must combine the two ASAP. I’ve developed a taste for wine, after going through the cheap ones when younger. And I went to a Bonnie and Clyde party in Washington DC where we all rented flapper costumes and drank our booze from tea cups. Even the sliding glass door had “pretend” bullet holes in it. Looking forward to seeing how your prohibition or depression research reveals itself in the book. Can hardly wait. I’ve enjoyed this series since the first book. Can’t wait to try the drink and read the book! So excited to have another Wine Country Mystery to read. Big fan of the series, and the author, from the beginning when I was living in the Virginia region close to her and the vineyards. Always good to have another of her books to read.